Shushi, September 19, 2015 — On September 19, the Hayastan All-Armenian Fund officially unveiled Shushi’s newest institution of higher education, the Yeznik Mozian Vocational School, with Nagorno Karabakh president Bako Sahakyan heading the jubilant opening ceremony. The construction of the ultra-modern campus was made possible by the Hayastan All-Armenian Fund’s French affiliate, through the bequest of Yeznik Mozian. The project received additional support from the government of Nagorno-Karabakh. The Yeznik Mozian Vocational School is the only institution in Artsakh to specialize in the teaching of construction-sector trades. The opening ceremony was attended by close to 100 delagates from France, including members of the late Yeznik Mozian’s family, Parliamentarians, leaders and representatives of regional and city councils, clergymen, representatives of French-Armenian organizations, and industrialists. The delegation was headed by Bedros Terzian, chairperson of the Fund’s French affiliate, and accompanied by Ara Vardanyan, the Fund’s executive director. The two-story campus has a total area of almost 4,050 square meters. Designed by French-Armenian architect Alain Daronian, it’s modeled on French vocational schools and was built with the assistance of an advisory committee. Project coordinator Robert Aydabirian, who is also the vice president of the Yeznik Mozian Vocational School and a member of the Fund’s French affiliate, has played an instrumental role in the implementation of the complex project. “The opening of the vocational school which our uncle, Yeznik Mozian, dreamed of, is the best reward for years of hard work,” Aydabirian said. “Already 70 students are enrolled for the school’s inaugural year. Thanks to its supporters and young faculty, this school will graduate cadres of highly qualified professionals, who will go on to contribute to the development of cities and villages across Artsakh. By applying the latest technologies and novel approaches to various aspects of the construction industry, the school’s graduates will help foster a positive environment for economic growth, which in turn will have a wonderful impact on all sectors of the population.” At the end of the ceremony Robert and Hermineh Aydabirians were awarded with Diploma of Honorary Citizens of Shushi. Designed to accommodate up to 450 students, the school features all required amenities for teaching a curriculum that combines general education and specialized vocational courses. Those amenities include well-appointed classrooms, fully equipped workshops and labs, a library, a storage space for educational materials and machinery, and central heating and air-conditioning. Students, who come from various regions of the republic, will receive a three-year education. While general academic courses will give them a solid intellectual foundation, they will specialize as locksmiths, metalworkers, roofers, welders, ironworkers, plasterers, masons, painters, tile setters and polishers, carpenters, electricians, plumbers, and HVAC technicians. As part of their coursework, students will also acquire hands-on experience by working part-time at local construction companies. The school’s staff, have received their training and certification in France. To ensure compliance with European educational standards, the Yeznik Mozian Vocational School has entered into a long-term cooperation agreement with a vocational school in France. In the words of Bedros Terzian, the Yeznik Mozian Vocational School stands out as the largest education project supported by the French-Armenian community to date, in terms of not only funding and man-hours, but also the school’s long-term vision and far-reaching impact on the socio-economic development of Artsakh, through the development of a specialized workforce which this republic sorely lacks today. 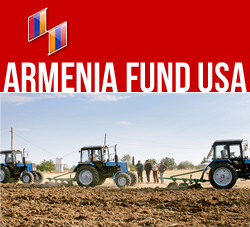 ARMENIA FUND USA — founded in 1992 — was one of the first of Armenia Fund’s 16 international affiliates and and serves constituents in all states east of the Mississippi. As a non-profit, non-governmental, nonsectarian organization, the Fund represents all Armenian constituents. Armenia Fund USA is the largest contributor among the 16 international affiliates – supporting strategic infrastructure projects in Armenia and Karabakh. The Fund has adopted a policy to go “Beyond Bricks and Mortar” to provide sustainability for projects it sponsors.